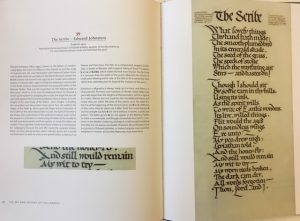 The Art and History of Calligraphy, published May 2017 by the British Library, does pretty much what it says on the tin! 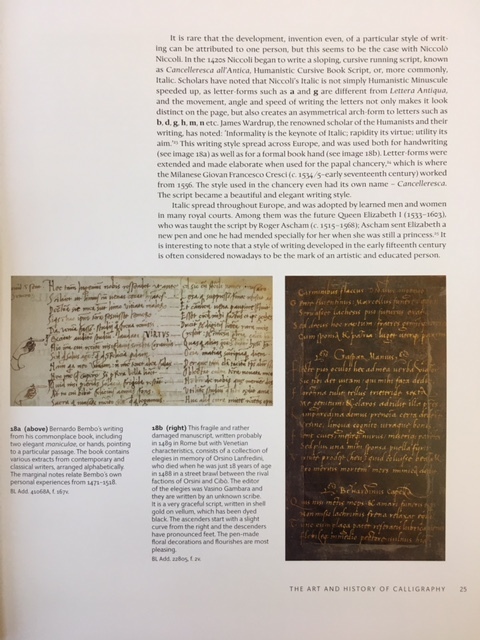 It covers writing from what is thought to be the earliest known writing by a woman in Britain in the first century, to the present day (as much as a book published in 2017 can do that!). 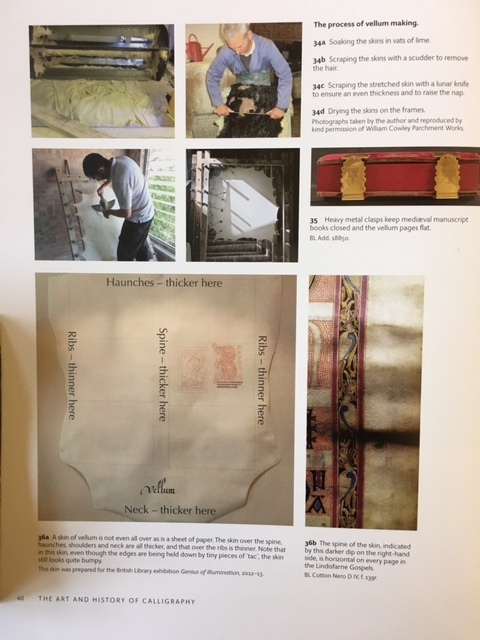 Here is a sneaky peak inside the book. 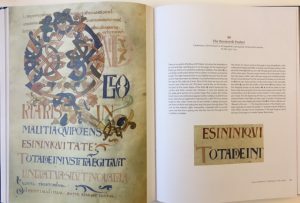 What I love about the design is that images of manuscripts are large and so it’s possible to get up close and personal to the letters. Here a page from the Luttrell Psalter has been spread over two pages at the beginning of the book. I chose this page for its wonderful trumpeter – his instrument long enough almost to extend right across the whole column of text! The first chapter is called, surprisingly enough, the Art and History of Calligraphy, and, after defining the way in which calligraphy is going to be regarded in the book, traces writing through the ages. 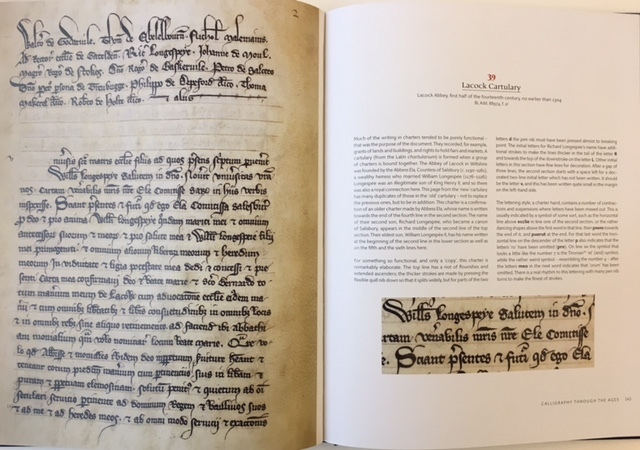 A number of manuscripts will be familiar, but there are some new ones here, including this lettering by Bembo and a delight of chrysography on dyed black vellum. Then a chapter is devoted to how the manuscripts were actually made, including quills, vellum brushes, pigments and gold. 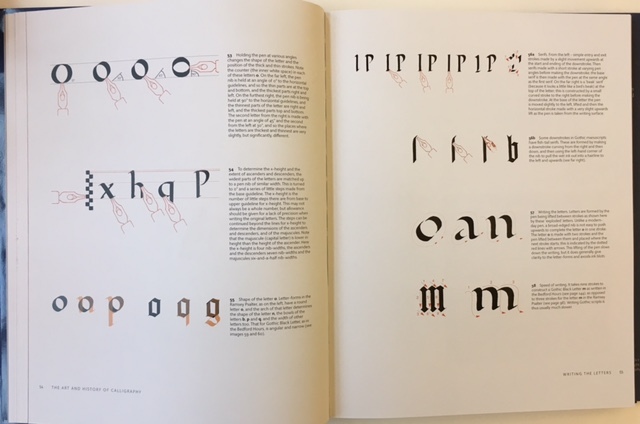 This is followed by a section on Writing the Letters, based on Edward Johnston’s 7-point analysis. 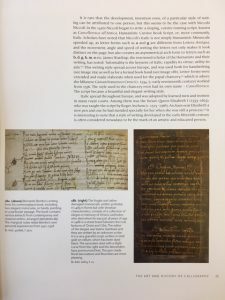 And then there are full page double spreads of over 70 manuscripts from the second century AD to right up to the present day. In many cases, as here, there is an enlargement of a couple of lines to show the lettering really closely. 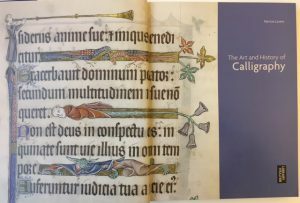 The Bosworth Psalter is on the right. 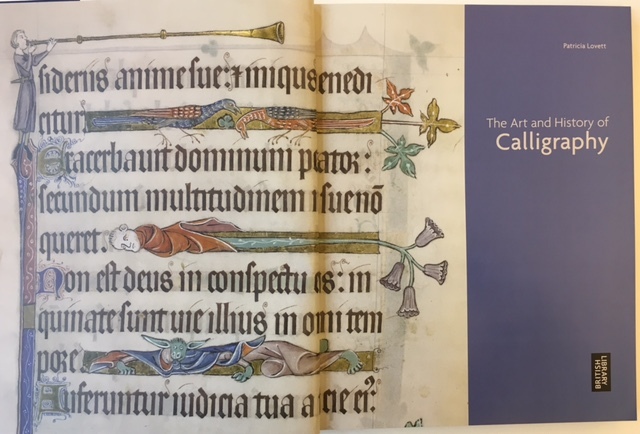 Here is the Lacock Cartulary with wonderfully flourished letters. 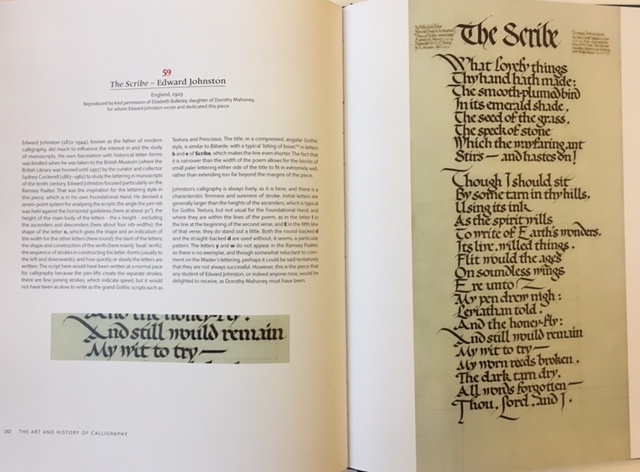 And this is one of the first times that Edward Johnston’s Scribe, given to Dorothy Mahoney, has been shown this size in full colour. 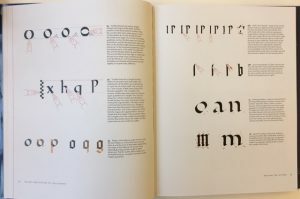 And the book is brought as far up to the present day as a publishing schedule will allow. 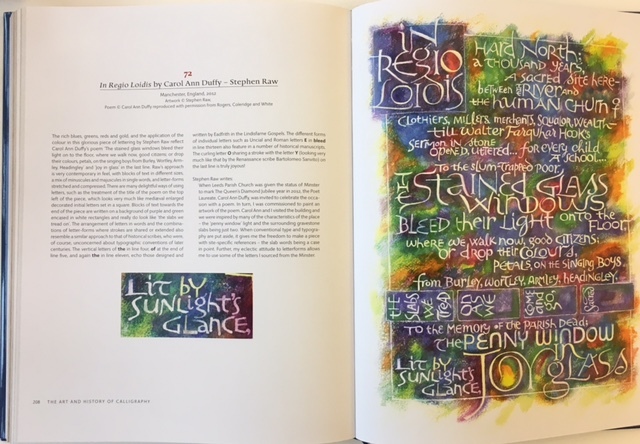 A stunning piece by Stephen Raw of a poem by Carol Ann Duffy is shown on the right. 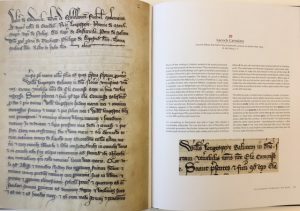 I really enjoyed writing the book, sharing information that I have learned from others and researching the manuscripts, and I do hope that others will enjoy reading it. It’s available from the British Library Bookshop, and I am also selling it through my website. 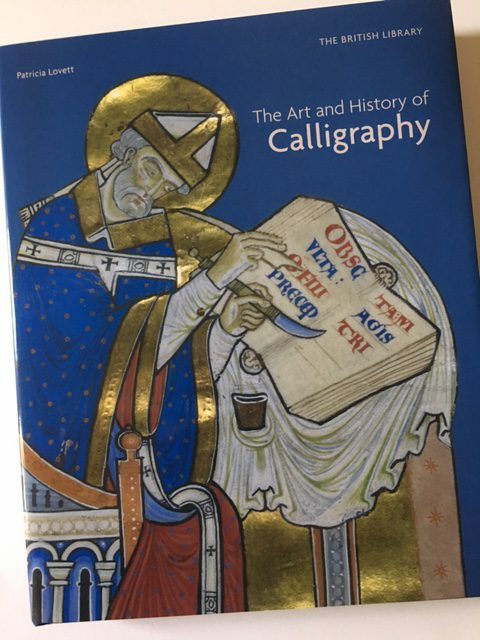 If you order a copy from me here then I shall happily write a name in the book calligraphically to make it really special. 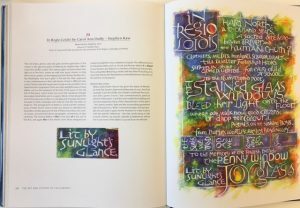 This entry was posted in Blog, Books, Calligraphy and lettering, Calligraphy techniques, Interesting stuff, Lettering, lettering, Manuscripts and tagged Art and History of Lettering, British Library, calligraphy, history of calligraphy, history of writing, lettering, manuscripts, Patricia Lovett on 16 April 2017 by Patricia.